A NASAprobe circling Mars is back at full strength as researchers ponder its past viewsof possible cave entrances on the red planet?s surface. The agency?sMars Odyssey spacecraft resumed science operations this week after spending severaldays in ?safe mode? due to a Sept. 14 software glitch. While in safe mode, aprecautionary configuration designed to preserve the orbiter?s health during aglitch, engineers on Earth methodically restored Odyssey?s onboard systems. "Thespacecraft reacted exactly as it was designed to for this condition," saidRobert Mase, NASA?s Odyssey mission manager at the Jet Propulsion Laboratory in Pasadena, Calif., earlier this week. Meanwhile,researchers are hoping to use the revived probe and other red planet orbitersto hunt for more cave-like pits akin to those found by Odyssey and the MarsGlobal Surveyor earlierthis year. Dubbed the ?Seven Sisters,? 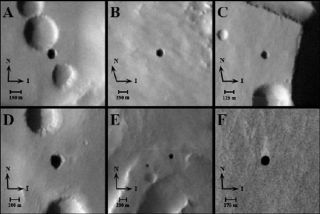 the dark holes were discovered on amassive martian volcano dubbed Arsia Mons and range between 328 to 820 feet (100to 250 meters) in diameter, mission managers said. "Theyare cooler than the surrounding surface in the day and warmer at night," saidGlen Cushing of U.S. Geological Survey's Astrogeology Team and Northern Arizona University in Flagstaff, Ariz., in a Friday statement. "Their thermalbehavior is not as steady as large caves on Earth that often maintain a fairlyconstant temperature, but it is consistent with these being deep holes in theground." Researchersdescribed Odyssey?s potential cave finds, which were previouslyreported on SPACE.com, in a recent online edition of the journal GeophysicalResearch Letters. "Whetherthese are just deep vertical shafts or openings into spacious caverns, they areentries to the subsurface of Mars," said study co-author Tim Titus, of theU.S. Geological Survey, in a statement. "Somewhere on Mars, caves mightprovide a protected niche for past or current life, or shelter for humans inthe future." Because themartian Seven Sisters are perched high up on Arsia Mons, near Mars? tallestmountain, their extreme altitude would make their location a poor candidate tosupport future astronaut bases or possible microbial life, mission researcherssaid. With MarsOdyssey now out of safe mode, the orbiter can also resume its role as acommunications relay between NASA?s twin red planet rovers Spirit and Opportunity on themartian surface. WhileOdyssey was unavailable, the rovers beamed their daily communication signalsdirectly to Earth, NASA officials said. The orbiter launched towards Mars in2001 and is partway through its second mission extension, they added. Anotherplanetary probe jointly run by NASA, the international Cassini spacecraft currentlyorbiting Saturn, is also back to work after its own safemode session. A powertrip caused by a run-in with a cosmic ray put Cassini in safe mode on Sept. 11after the probe?s flybypast Saturn?s moon Iapetus. The glitch delayed the spacecraft?stransmission of the flyby data by about a day and the probe was back to fulloperation by Sunday, NASA officials said.